Chromosomal microarray test that is commonly used for evaluating children with developmental disorders, such as autism. Since few genes have previously been implicated in clubfoot, this discovery represents the most common cause of isolated clubfoot to date. This technology can be used immediately for genetic testing. The DNA duplications on chromosome 17 were found during preliminary screenings performed in 40 patients with inherited clubfoot, which the researchers determined were in the same region previously linked with limb abnormalities, developmental delays and heart defects. 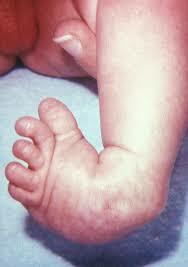 However, such duplications were not found among 700 control subjects without clubfoot. Finding the causes of congenital clubfoot — the most common musculoskeletal birth defect — is of critical importance to provide counseling to the families, help in the understanding of the natural history of the deformity after correction and, eventually, in the development of treatments based on the basic molecular abnormality. This study demonstrates that in a small subset of patients (4 out of 66) with congenital clubfoot, a chromosomal abnormality is associated with the deformity. Interestingly, this genetic variation is also associated with other abnormalities including short stature, hip dysplasia, and subtle nail and bony deformities. This later finding separates these patients from the most common form of clubfoot, idiopathic clubfoot, and highlights the importance of careful clinical evaluation when ascertaining patients for genetic studies. In summary, this is an important study that adds to our current understanding of this common birth defect.